Calculations at a sharp kink or folded rectangle. This is a special shape of a concave hexagon. Enter the width, the short or long side of each leg and the angle. The angle must be smaller than 180°. Choose the number of decimal places and click Calculate. 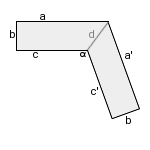 Please enter the angle in degrees, here you can convert angle units. Lengths, width, diagonal and perimeter have the same unit (e.g. meter), the area has this unit squared (e.g. square meter).